How often do you clean your gutters? Clogged gutters are the leading cause of water in basements and cracked foundations. This can lead to costly repairs over time. Cleaning gutters can also be a dangerous chore, requiring extended periods of time working on ladders. If you’re not fully equipped on your own, it’s best to leave it to a trained professional who is fully licensed and insured to perform the task. 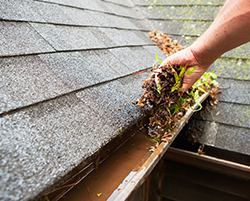 Our affordable gutter cleaning services will ensure that any and all debris that leads to clogs and gutter damage will be carefully removed. Get clean and free-flowing gutters today with dependable service from the experts at Discount Seamless Gutters! Gutters can become damaged due to severe weather, clogging, and general wear and tear. We provide comprehensive gutter inspections, maintenance, and repairs to return your gutters to optimal condition. Whether you need to replace an entire section of your gutters, take apart a downspout to clear a difficult clog, or simply refasten some loose nails, our expert team has you covered. Our affordable gutter maintenance services can help you avoid the expense of replacing your gutter system. Gutters serve a simple, but necessary function for any home or business. By transporting water away from your property's foundation, gutters protect your building from water damage. Leaky and ineffective gutters can lead to significant damage to your home or business over time, so it’s extremely important that you get quality products and installation services. We provide free estimates for gutter installations, where we will recommend the ideal gutter system for your property and provide a fair, honest and accurate quote. We take into consideration your landscaping, roofline, home aesthetics, and other key factors before helping you make a decision about what gutter are right for your home. After you have selected your gutters and we have provided a quote, our trained technicians will go the extra mile to ensure that you get exactly what was promised. 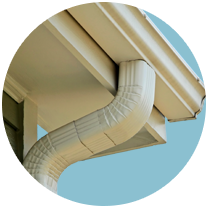 Our seamless gutters are not only attractive, they are guaranteed to protect your home for years to come!